Hi everyone! I’m Shanon of A Day in the Life of a Title I Teacher. 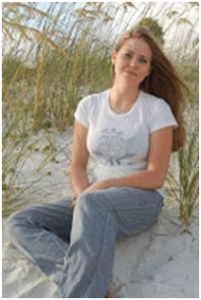 I’m so excited to be a guest blogger here at Minds in Bloom. I love sharing ideas and collaborating with other educators. I am just starting my second year of teaching; I am the Title I Reading teacher at a small school in the Metro Atlanta area. 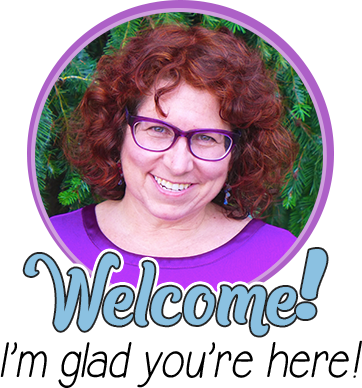 Rachel, thank you for all of the amazing resources, materials, and ideas that you share with educators everywhere. 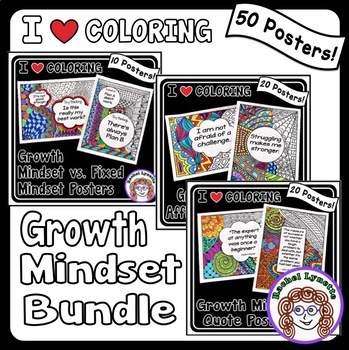 Minds in Bloom truly helped me make it through my first year of teaching! In college we learned many things: what to do as teachers, how to create centers, how to write a lesson plan, where to go for standards, etc. Many things that we learned we will take with us and use in our own classrooms, and many things we will never use outside of a college classroom. How many times have you told your students that they will have to complete a research project only to hear things such as, “I hate writing papers,” or “I’m not good at writing?” In one of my science methods classes, my instructor introduced us to a new way of organizing information for those “dreaded” research papers. 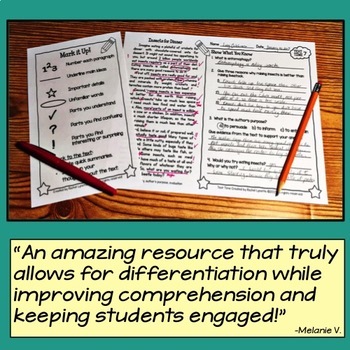 This method can be used for any grade level. 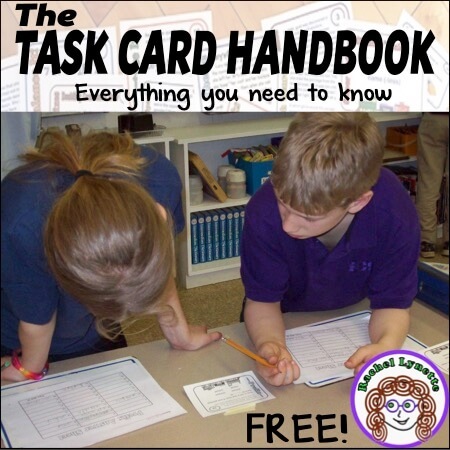 All you need for this activity is one pocket folder per child, five envelopes (3” x 5”) per child, and 3-5 index cards per envelope, depending on how much information you want the students to gather. 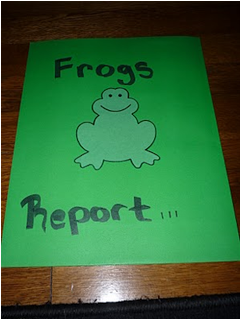 First, create a cover for your research folder. You could have the students write the topic of their research paper or do a generic cover with something like “Mrs. 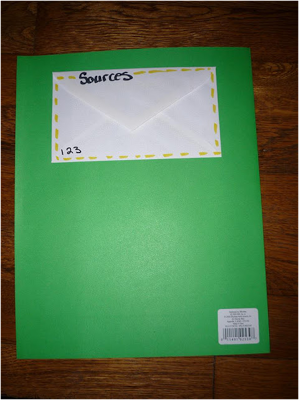 Bourne’s Research Folder” that could be used over and over throughout the school year. Next, have the students glue four envelopes to the inside of the research folder. These four envelopes will hold all of the information the students gather for each of the four body paragraphs of the paper. The students will then write the main idea of each paragraph on the envelope flap. Students will then glue the fifth envelope to the back of the folder; this is where the students will keep the information they need to cite their references. Inside each envelope the students will place 3-5 index cards: one index card per fact that you would like them to write about for that paragraph. I like to color code our index cards and envelopes so that if the cards fall out, you can easily identify where they belong. 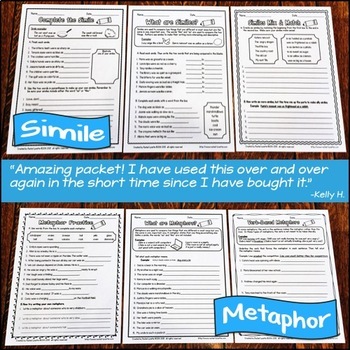 Each day you give the students time to research one of the four paragraph topics for the report, have them record one sentence per card, and have them store the cards in the correct envelope until further notice. 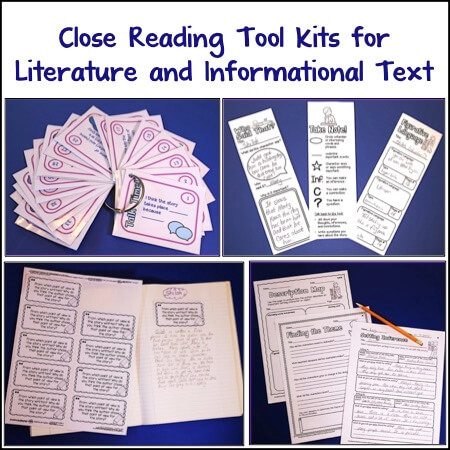 After you have completed the research for all of the topics, you will give the children 20 minutes to write their rough drafts. They will probably complain and say, “It can’t be done!” But, believe me–it can! 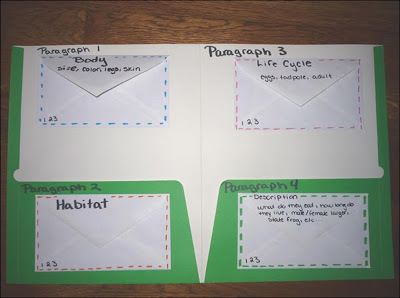 Tell the students to take the information from each envelope and create a paragraph by arranging the facts in meaningful or sequential order and by writing the facts in complete sentences; remind the students that each envelope represents one body paragraph. As a class you will discuss what the introduction and conclusion paragraphs should say or look like. 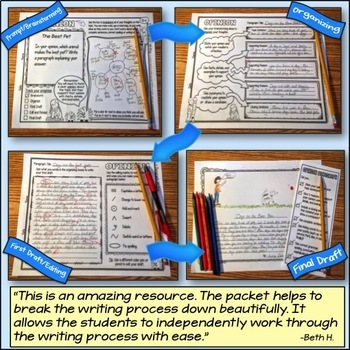 If you are working with lower grade levels, then you can do a quick mini-lesson on introduction and concluding paragraphs and create these paragraphs together. If you teach upper grades, then you can skip this step and have the students create and write their own conclusions and introductions. Writing the introduction and conclusion as a class allows you to show how these paragraphs differ from one another, and it allows you to show the students how to formulate ideas to create introductions that hook the reader and conclusions that sum up the research paper. 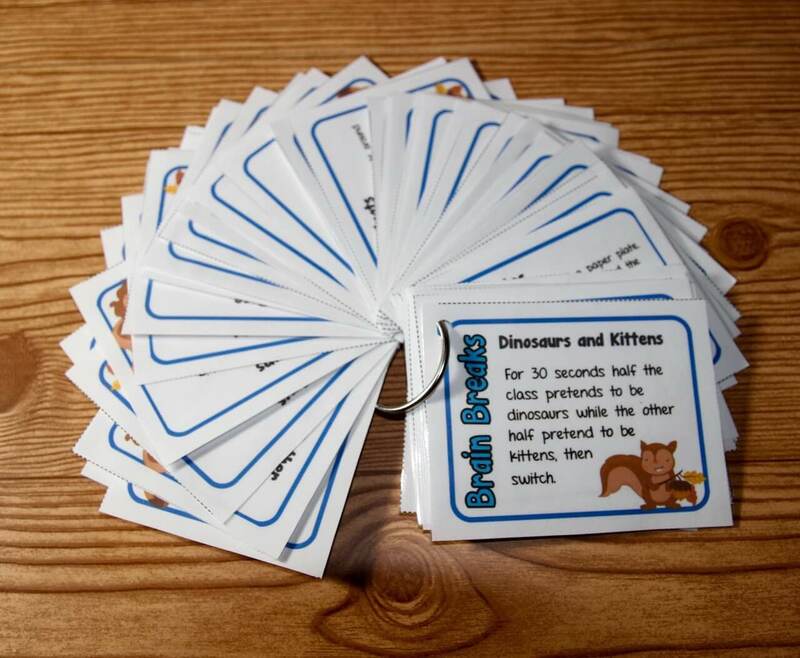 The children will be amazed at how easily they can gather information and write a great research paper. This is especially good for differentiation for students who have a hard time gathering their thoughts and information and formulating paragraphs with like information. 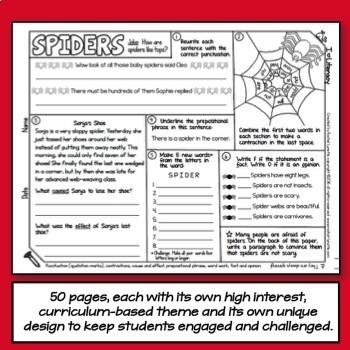 These folders can be used for any topic. 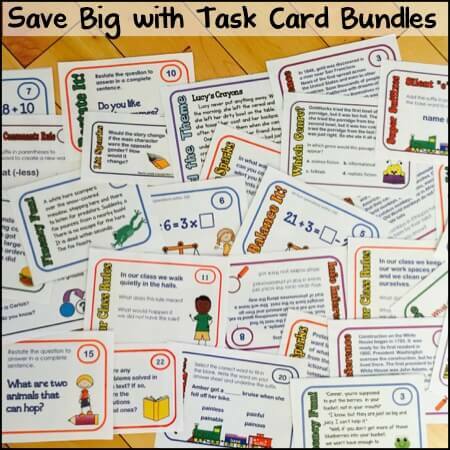 They also make a great resource for students to take home or for open house work displays. I hope you found this research folder technique to be a valuable resource for your students. I’m a second-year Title I Reading teacher. I work with students in 1st-5th grades. I’m also a member of many of my school’s committees and clubs: Administrative Leadership Team, Focus School Team, and Testing Committee. I’m also the newest coach to our Helen Ruffin Reading Bowl Team. Get to know me better at A Day in the Life of a Title I Teacher and on Facebook. Try the New Cardtopia Task Card App! Love this! As we move into our first research project in the next couple weeks, I was dreading how to go about this. Your folder idea is by far the easiest method I've seen! Thank you for sharing!! Thank you! I've found that it's one of the easiest way to get students to organize their thoughts and information for research projects. 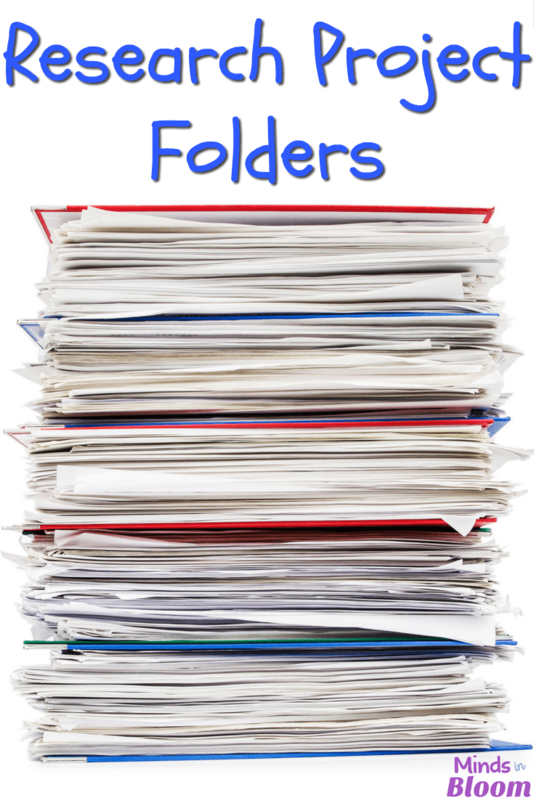 I would love to hear about how the folders turn out in your classroom! If I had learned this method in school I would not have dreaded projects so much! Going to do that for my nephew next time they have a project! As a author I highly appreciate your writing concept. Which is very handy and delightful to me. I hope such kind of writing help us a lot to enjoy more writing do my math homework for me which help us a lot for any kind of writing servies. 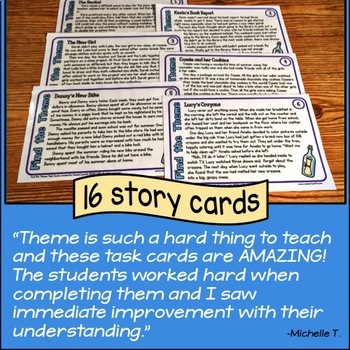 I saw these in a PD that I participated in and liked them… (I am also in a metro-Atlanta school)… I'm glad I saw them again on your post!